First trained as a nuclear electronics technician and reactor operator in the US Navy, Maureen Searles has worked on HFIR’s operations team since February 2015. March 20, 2017 – Nuclear reactors require around-the-clock attention. Before the sun has even begun to rise, nuclear reactor controller Maureen Searles is already well into her shift at Oak Ridge National Laboratory’s High Flux Isotope Reactor. HFIR produces one of the world’s highest steady-state neutron-flux beams for scientific investigations. More than 500 researchers each year visit the reactor to harness the unique properties of neutrons to solve a wide array of problems spanning physics, chemistry, materials, engineering, and biology. Searles says her duties are exciting and always changing. On any given shift, she might find herself monitoring the reactor up in the control room or testing the reactor’s water chemistry down on the ground floor. Other days she can be found working in the reactor bay loading experiments into the reactor core or, every so often, changing the reactor core’s fuel supply. 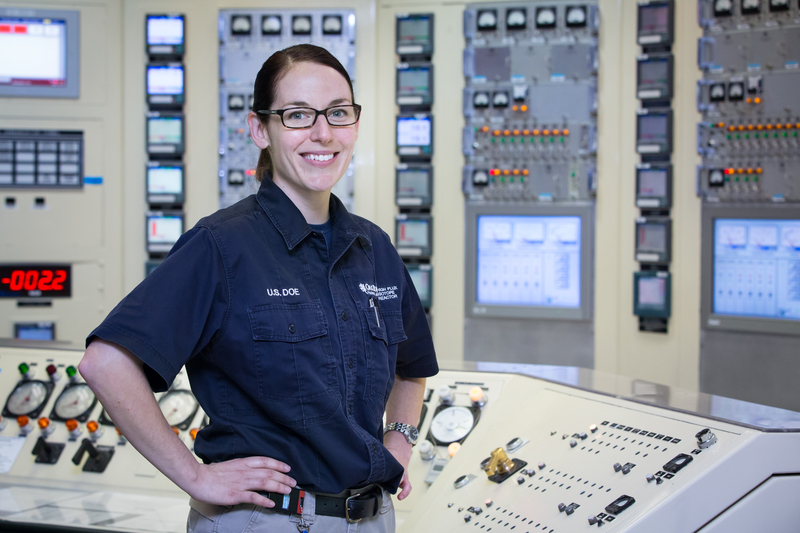 Searles recently celebrated her two-year anniversary at the plant but admits that a career in nuclear operations is a far cry from what she initially envisioned. The Pennsylvania native began her college education in Georgia at the Savannah College of Art and Design and then transferred to the University of Pittsburgh to finish her degree in art and architectural history. After graduation she was intent on applying to graduate school and decided to turn to the military to help with the cost. Searles signed on for training as a nuclear electronics technician in 2004 and completed the 12‑month training at Nuclear Field “A” School and Nuclear Power School at the Naval Nuclear Power Training Command in Goose Creek, South Carolina. Upon graduation from power school, she was transferred to the Navy’s Nuclear Prototype Command in Ballston Spa, New York for six months to complete her reactor operator training. “My work as a nuclear electronics technician in the Navy gave me a solid foundation in reactor theory and principles, as well as physics and chemistry, but it could not completely prepare me for my position at HFIR because this reactor is unique and, therefore, different from any I’ve trained or worked on before,” she said. In her six years of service, Searles carried out her duties as a nuclear reactor operator on board the USS John C. Stennis, an aircraft carrier based in Bremerton, Washington. During her enlistment, she was able to earn a second bachelor’s degree in nuclear engineering technology from Excelsior College. After six years in the military and a four-year stint in Washington, D.C. working in federal records declassification, a friend at HFIR encouraged Searles to apply for a position as a nuclear reactor controller. “Although D.C. is an exciting place to live, the high cost of living, the population density, and the traffic were not things I saw myself enduring long term,” she said. “I was hesitant to return to the nuclear field because I feared that I had forgotten too much and had perhaps lost my ability to perform well under pressure. Though her current job continues to challenge and refine her skills, Searles recalls one of her proudest moments was being recognized as the first certified female nuclear reactor controller in HFIR’s 50-year history. She says she hopes women in STEM fields will continue to debunk stereotypes and would like to see a greater emphasis on education for girls who want to pursue careers in science and technology.